Maelstrom was one of the classic Roleplaying games of the 1980's innovative in design and setting alike. A lifepath system creates characters that are both deep and yet competent for the tasks ahead. Rewritten and expanded rules provide fast and flexible gameplay whilst still covering most in-play situations. 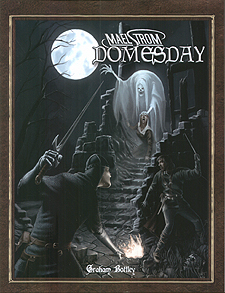 The original Maelstrom free-form magic system allows a magical character to accomplish almost anything... at a price.